Never-seen-before pictures of characters from Star Wars: The Last Jedi were featured in the summer issue of Vanity Fair, and they will leave fans with several unanswered questions and doubts. One of the most surprising aspects of this photoshoot is the first look of Laura Dern's Admiral Amilyn Holdo, who is seen with magenta-coloured hair. Pablo Hidalgo, a creative executive at Lucasfilm Story Group has confirmed that Dern's character is a human and high-ranking officer in the film. Also featured in the pictures is Benicio Del Toro, whose characters name has not yet been revealed, and a whole bunch of new characters who seem to be dressed for a party. Human and non-human characters are seen wearing white dresses and tuxedos in one photograph. About these characters, Hidalgo said to Vanity Fair, "What we’re going to see in The Last Jedi are some people who have managed to carve out a life for themselves where they can live apart from the galactic struggle. They found a way to live above it or beyond it. There’s a class of wealthy that have helped build all sorts of loopholes in society that will always ensure that they’ll survive or even thrive no matter what else is happening out there." Star Wars: The Last Jedi will most likely be darker than the last film The Force Awakens. In the trailer of the film, Luke Skywalker was seen saying, "It is time for the Jedi to end." It is the second installment of the Star Wars trilogy, which is the third trilogy of the franchise. It is centered on Daisy Ridley's Rey, who trains to become a Jedi, as well as Resistance pilot Poe Dameron, played by Oscar Isaac and storm trooper-tuned-good-guy Finn played by John Boyega. Star Wars: The Last Jedi is set to release on 15 December, 2017. It will mark the last appearance of Carrie Fisher as General Leia Organa in the films; the veteran actress shot for the sequel before she passed away on 27 December, 2016. Pictures of a Vanity Fair photoshoot where Fisher posed with other characters were also revealed. 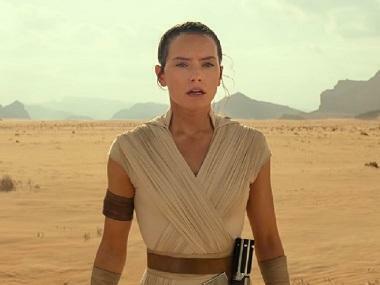 Star Wars: Episode IX title sparks fan speculation — 'How can it be The Rise of Skywalker when the Skywalkers are all gone?